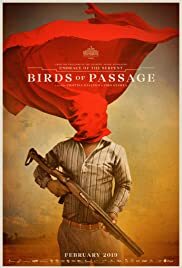 BIRDS OF PASSAGE plays like a Colombian style GODFATHER epic. Both films begin with a young couple’s love. In BIRDS OF PARADISE, Raphayet (José Acosta) is captivated by Zaida (Natalia Reyes) at her “coming out” ceremony, and is determined to come up with the enormous dowry her mother and family matriarch Úrsula (Carmiña Martínez) demands. This where the trouble starts. He gets the dowry from drug money involving wats between clans that eventually is too difficult to solve. The film is good study of how things get seriously totally out of control from a small incident which in this case is Rapha’s trigger happy outsider Moisés. BIRDS OF PARADISE is a colourful film (though a lot of colour is blood red) showing Colobia as many have not seen before, especially with the indigenous Wayuu customs, traditions, and celebrations In addition there is the classic tragedy arising from pride, greed, and the clash between the old and new worlds.